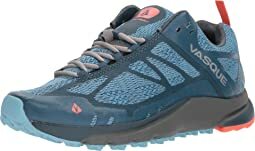 At Vasque, they are committed to making functional, innovative and aesthetic footwear that performs to the highest standards. Their ultimate goal is to make shoes that inspire you to get outdoors and embark on an adventure. 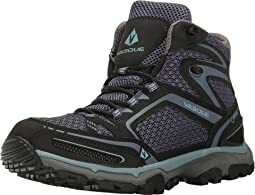 Incorporating and developing new and innovative technologies into their boots is what keeps Vasque at the top of their game. 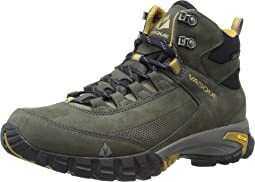 Vasque offers various outsole systems, and components targeted to your outdoor activity. Whether you´re backpacking, trail running, or mountaineering, they have the right shoe for you. 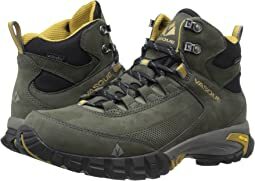 Vasque holds a reputation for making shoes that stand up to the test of time. Simply put, they don´t make throw-away footwear. 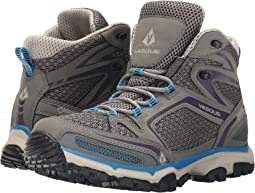 In addition to their commitment to high-performance, outdoor footwear, Vasque also cares about the environment. From their boots, to their packaging, to their marketing materials and day to day operations, Vasque scrutinizes all elements of their business, striving to make a lighter, ecological footprint. I bought a 1/2 size up based on the reviews, but they were too big, and no stock in my size. I wanted lighter weight ankle support for a post ankle fracture. Will wait till it returns in my size. Also - the insole was all smashed up and uncomfortable, no big deal for me as they are removed easily and I wear orthotics. 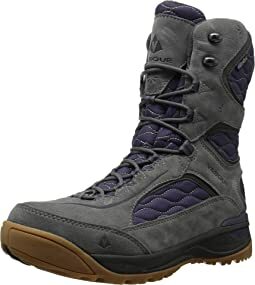 Rugged snow and backcountry boot. Great for snowshoes. I received these shoes and wore them right out of the box with no issues. I have worn them for three days for walks, logging 2-5 miles a day with them. No blisters, no aches. I generally wear Keen shoes. These are a bit more narrow in the toe box but certainly weren't that hard to adjust to. I was able to get a looser fit by adjusting the laces in the toe box area. 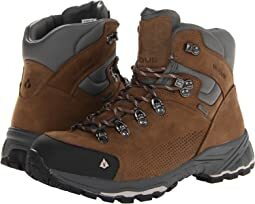 They seem to be good with moisture, also, as I walked in long, dew-covered grass without getting wet feet and the shoes dried quickly. 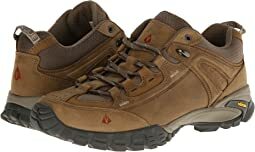 I purchased this pair because I was looking for a walking shoe that had a smaller profile than Keen's hikers. 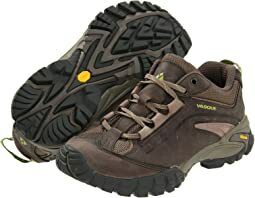 The Keen walking shoes (such as Terradora) were just too snug in the toebox. I also like that the laces go farther down to the toes, not only because they are easier to adjust, but because they make my feet look smaller (size 11). Fit was right on sizing. 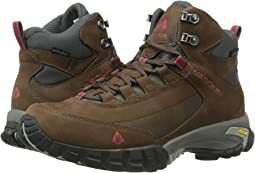 I thought the shoe was a little heavy/clunky for a light hiker, at least it is in a 14. Made on a relatively straight last, so don't count on being able to spread your toes very much if at all. The upper rides a bit too high on the ankle, which is a common problem for almost all shoes in larger shoes. 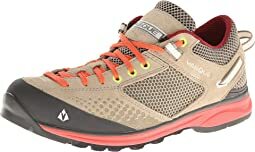 The Vasque Velocity is a better light hiker, IMHO. Nice looking shoe. Toe cap is protective. Relatively low drop. Reasonable toe box room, but mid foot was a bit narrow for me. Also, the ride is pretty firm. 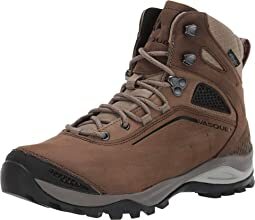 But this is otherwise a great, light hiking shoe. I have the original Constant Velocity, which I like but it has a slightly narrow fit and little room for padded socks. 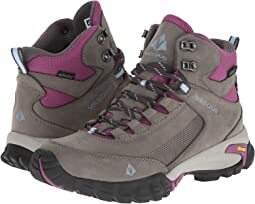 The Constant Velocity II was at first roomier and quite comfortable (although I couldn't make use of the upper lacing holes because of my lower instep). The shoes also seem to cradle my foot better than the earlier version. But then I noticed a quite uncomfortable ridge below my arch and I just couldn't imagine hiking in it. Very disappointed to send them back! Wasn’t a big fan of these. Liked the look, that’s where it ended. Weren’t nearly as comfortable as I thought they’d be after I let my foot bed in a bit. 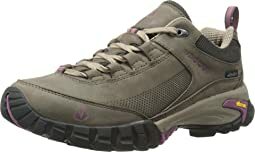 I was so happy that these run narrow, as narrow hiking shoes are a rare breed. I wear a true 9.5-10 AA or Narrow, and the 10 M was a perfect fit. So light, no heel slipping, I could wear these all day with little to no break in period. Perfect boots, if only they were available a half-size larger... just a little snug over the top of my foot, and my foot is not wide. Too late in the season to find it in my size, darn it. I tried Wide in size 8 and 8.5. In both sizes, the shoe was too narrow for comfort, especially the toe box. Disappointed. I returned both pairs. 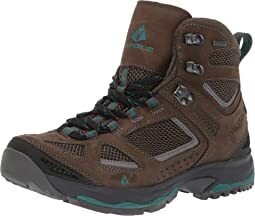 I'm pretty consistently a size 11.5 in sports/athletic shoes, including two other Vasque models I've had ( Juxt; Grand Traverse), but I had to go up to a 12 with these. out of the box hiking trip = 5 miles. no blisters, no chafing. regular hiking sock, no liner. very nice! I have a pair of the same shoe from a few years ago and these are equally comfortable. They have a lot of cushioning - that might not be what some are looking for but I am so I appreciate it. The sizing seems off - I wear a 7.5 in 'street' shoes and an 8 in running shoes but in these I had to go up to a 9. The 8.5 felt snug. The 9 feels somewhat loose but not loose enough to be a problem. To me they feel like they have a wide toebox which I need but that might be partly because I'm wearing the loose 9 so overall they feel bigger than a "perfect" fit would. 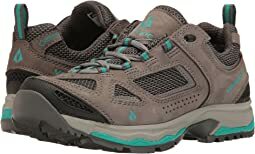 I don't run in them - I'm using them just as a daily wear shoe and for light hiking. For those uses they're great for me. I was surprised to read the other negative reviews - as I said I liked them enough to buy a second pair. 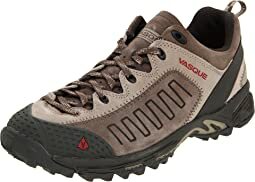 Vasque its an excelent shoe maker, the Trailblender II have a great lateral support and cushion. I was looking for a narrower boot and this fit the bill. With my custom orthotic in place the boot is very comfortable and gives good arch, ankle, and foot support. 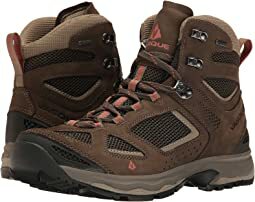 I normally wear a AA width and have a hard time finding a narrow boot so am pleased with the Vasque. It has a good tread on the sole and handles icy sidewalks well. 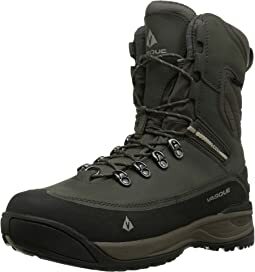 This boot has good looks, seems to be well built with excellent lacing system. Unfortunately, had to return them due to the fit not being good for me. Seemed to be larger than stated size and I thought sizing down would be too small. I wish they had fit. Toe box was too tight for my feet. Also, did not like the leather: too stiff. Had to return. 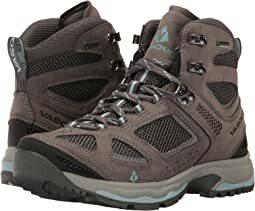 I have a pair of great Vasque hiking boots and wanted something similar in a shoe. Both times I ordered up a half size and got a good fit. Good walking shoe, does require some wear to break in. Ive been wearing them for about a week and they are slowly coming along. I wear them for work as lighter option than the boots I normally wear. 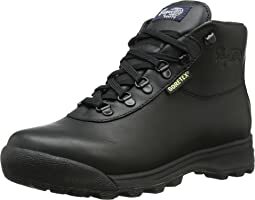 One thing i didnt like was the loop on the back of the shoe its function is minimal and it kept my pant legs from resting over the back of the shoe which i found annoying so I cut the loop off and now not only does the shoe look better imo it solved the riding problem. All around decent shoe for the price. Bought to replace original Trailbender's. Originals were the best/2nd best running shoes I've owned in 35yrs. Put hundreds of miles on them. Not crazy about replacement colors (yellow soles? ), however original color was unavailable. When first received they were tight, however after one run, they broke right ion and feel as great as the originals. I bought this shoe because it has a high toe box, soft upper material and amazing arch support. I usually wear a 9.5, but the size 10 fit perfectly. It massages your feet when you walk, and it provides grat support and comfort. I bought a second pair. The color is great, and traveling with them is going to be great! Got these for my son. He loves the fit and how they look. Very happy with them. 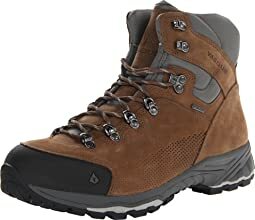 He wanted a good shoe for Colorado annual trip and they seem to be supportive along with stylish. As always the customer service at Zappos is terrific! I bought my first pair of these shoes at a sporting goods store, where I was convinced to buy a half size larger than I normally do. Liked them so much I bought a second pair at Zappos. I have such a high arch that I normally need to replace a shoe's insole with an orthotic insole--but did not need to do so with this shoe. The shoe also has a roomy toe box, which I like.